One of my pet peeves has always been the bad use of commas. And, to be honest, sometimes that means comma use that defies the rules of grammar, and sometimes that simply means that’s not how I like to use commas. I started thinking about all this when I saw the reading list my business partner, Neal Moore, recommended to a college class we recently guest-taught. The list included Eats, Shoots and Leaves, Lynn Truss’ truly delightful and funny book on punctuation use. 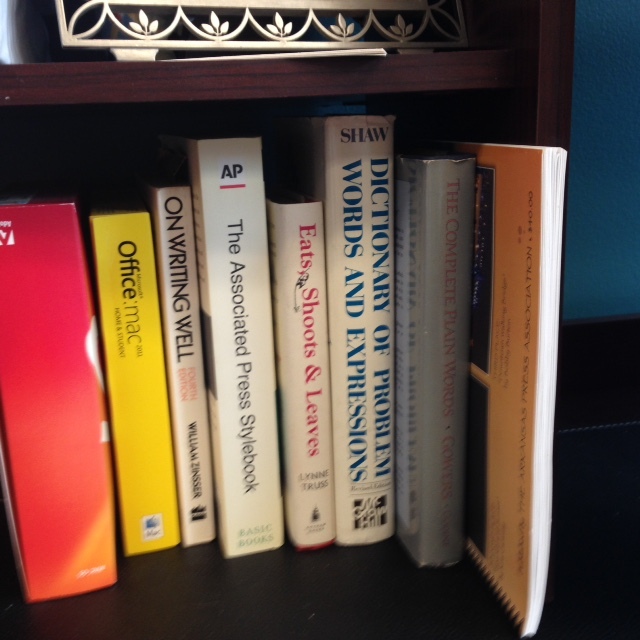 It holds a place on my desk right by William Zinsser’s On Writing Well, Harry Shaw’s Dictionary of Problem Words and Expressions and The Associated Press Stylebook. Commas, no doubt, are tricky. Their use often seems to be driven as much by emotion as by logic. Truly, some of the most spirited discussions I’ve joined in as a reporter and then editor have been over the placement — or lack of — a comma. Probably because I started my career as a newspaper journalist, I learned early to eschew the serial comma. Though I had been thoroughly schooled all the way through college to insert that final comma before the word and in any list (red, white, and blue) that final comma soon appeared fussy, pretentious and totally unnecessary. (If it hadn’t, I would have written “fussy, pretentious, and totally unnecessary.”) While the magazine writers and lawyers I know cling to that serial comma (known as the Oxford comma in Britain, where, ironically it is not widely used) I just can’t warm to it again. In the first sentence, only some of the folks in line were able to get tickets, but they were happy that they did. In the second sentence, every satisfied person in that line managed to get one of those tickets. So you really have to know what you are trying to say and make sure your commas do the job you intend them to do.